Directions: We are located off Exit 50 of I-40. Head North to the second stop light. Bear left at the second light and you will see us immediately on your left at 30 All Souls Crescent in Historic Biltmore Village, Asheville, NC. We are always happy to help you find us. Please call if you need additional directions. You can Contact Us at (828) 274-8889. Biltmore Lamp & Shade Gallery is a proud member of the Historic Biltmore Village Merchants Association. 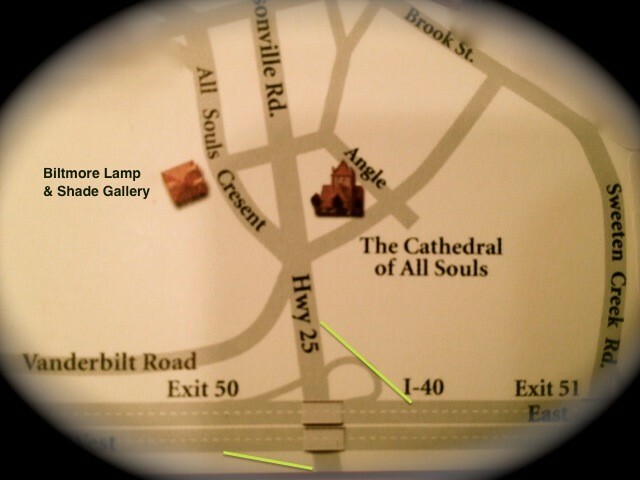 You can pick up a map of Biltmore Village while visiting our store.